See what Roy Thomas' clients are saying about their Halifax home buying and home selling experience. Sold in 1 Day for $43,600 Above Asking Price! Very patient, encouraging, even tempered, very knowledgeable and able to instill confidence in his Clients. Trustworthy! Roy’s main concern was to make sure I understood what would happen with the process of selling. He sold the house in one day! How can you beat that? This was our first house and since we had owned it for 56 years, we did not have a clue on the procedures to sell the house. We chose Roy Thomas after talking with him and came to the realization that he was most knowledgeable and a real estate specialist dealing with seniors. Roy guided us through the procedures of getting the house ready for a showing and the day he put the sign on the lawn, there were two showings the same day. There were two scheduled for the next day and two more for the day after that. Roy’s marketing strategy produced amazing interest in the house. In fact we did not have to proceed with the showings, as the first two showings produced offers. Roy sold the house in one day. My most appreciative relationship with Roy was the thoughts and advice he provided after the offers were made. We entrusted the legal aspect of the sale to lawyer Greg. Auld on Roy’s recommendation and Roy advised us every step of the way on what was next and what to expect. He never let us wonder where the sale stood, but assisted and advised until the closing. I have the most respect for Roy Thomas and his dedicated team to produce the highest results that could be expected in all real estate matters. He sold the house in one day. How can you beat that? From start to finish it was a pleasure to have Roy deal with the sale of my house. Whenever I had a question or concern he answered it to my satisfaction. I would recommend Roy to anyone needing an excellent and knowledgeable Real Estate Agent. The Best! Roy had the time to walk us through this process. He was very professional but we always felt he had our best interests at heart. We would not hesitate to recommend Roy to anyone for their Real Estate needs. We are going to miss talking to Roy. Thank you for your service and friendship. Our house sold in 4 Days! That says it all! Roy provided information on the marketplace, how to show our home and we got results fast. We are completely satisfied with Roy and his Team. We would not hesitate for a moment to recommend Roy. Surprise Surprise! I got more for the house than I expected and more than the listing price. Thanks to you Roy. ROY SOLD OUR HOME AND HELPED US TO BUY A NEW ONE! We would like to take this opportunity to thank you for making the sale of our home on Avon and the purchase of a new one such a stress free experience. I can see why you are one of the best Realtors in this area. Your knowledge selling homes was indeed very evident. We certainly appreciated your patience as I repeated the same questions over and over again. Both of us knew that anytime we needed advice, all we had to do was call you and you had the answers we needed. Thank you for that. We never once felt pressured during the process of selling our home or buying our new one. We will definitely recommend Roy to everyone who is looking to buy or sell a home. Thanks again! OUR HOME WAS SOLD IN 2 DAYS MUCH FASTER THAN WE EXPECTED! We had to tell you how pleased we were with your services. Actually, we think that you are amazing! Our house was sold in just two days – much faster than we ever expected. Your understanding of how special our home was to us, your honest appraisal of its value, your wisdom in guiding us every step of the way and your responsiveness to our needs made us realize that we were in the best hands possible. Your marketing of our home was fabulous. You are a Residential Real Estate Specialist Extraordinaire!!! Roy, we can never thank you enough for the first class service you provided – you made us feel special. You are without a doubt the best real estate agent that we have ever dealt with. We wish you continued success in 2012 in a career that you excel at. My husband and I took Roy into our home back in 2006, we were looking to sell and buy a new property, He took us through all the recent sales in the area; thus showing us that our property was worth selling, and he had a feeling it would sell fast. Well it did, in 3 days in fact! Then with the quick sale we had to look for a new home pretty fast, and we had certain requirements. Roy was always there to answer our calls about different issues that would come up as well, Roy called us often to check in and see how things were going. Roy understood, and got us into a house where we wanted for the right price, therefore, we were so happy. We recently invited Roy into our home to see the upgrades and to see what he thought about potentially putting it on the market. We decided in the end not to list it at that time but took some good tips from Roy to improve the aesthetics of the basement and then we are going to list it again, and we will be calling Roy! 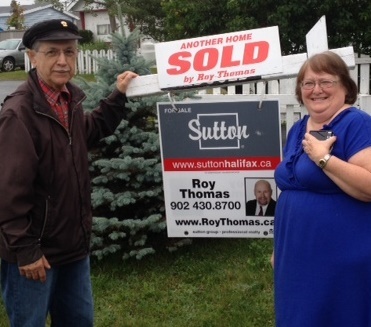 We have used Roy in the sale and purchase of several homes as we transitioned in and out of Halifax over the last twenty years. Roy has always been professional and courteous and I would not hesitate to recommend him as a Real Estate Consultant. WE ARE VERY PLEASED WITH THE SERVICE WE RECEIVED! Roy was always punctual with the viewings and always remained neutral. We were never under any pressure. However if we needed information or advice he was always extremely helpful. This was a very positive experience for us. I would strongly recommend Roy Thomas of Exit Realty Optimum as your agent should you be wanting to list your property on the market. He is very relaxing, natural, provides complete information step by step until all transactions are completed with prompt sales and service. Thank you Roy for taking the stress off me during this sale and guiding me all the way through the process. Our home was SOLD the first day of showing…What more can be said!!! It was a pleasure to work with Roy and Yvonne who were friendly, professional, accommodating and very informative. This Team inspires confidence by both word and action. Thank you Roy and Yvonne for helping to make this transition so easily entreated. It was a joy to deal with you for the sale of our home. After our call to you about putting our house on the market you arrived at our home with an excellent presentation and a review of the current real estate market. Your work for us was in every respect 100%+ and in as many words as you can find meaning Excellent! Your greatest asset though as we see it is that you are a person who engenders TRUST. Best regards and sincere thanks from both of us. SOLD FOR 97% OF ASKING PRICE! We consider it to be a very good decision we made in choosing Roy Thomas to sell our home. Both Roy and his most capable Assistant Yvonne gave us confidence that our best interests were always taken into consideration during every step of the process. Roy clearly enjoys his job and conveys that to his Clients with his pleasant and unflappable manner. He provided us with excellent regular progress reports thereby keeping our anxiety level to a minimum. We would not hesitate in recommending Roy Thomas as second to none when considering a real estate transaction. SOLD FOR 96.4% OF ASKING PRICE! First I want to thank you for your patience with me as a nervous Seller. The whole experience turned out to be wonderful Roy and Yvonne. You are an excellent agent, who knows how to price property fair and make it move. Your knowledge and years of experience was evident during the whole process of selling. My plans are to refer everyone I can your way and now I can confirm to new customers my own personal experience – which was perfect! Thank you. We highly recommend Roy Thomas for all your real estate needs. We found Roy went above and beyond what other agents had in the past. We feel Roy is a hard working agent, honest, dependable, and caring and a decent man of great integrity. You will definitely be taking a step in the right direction with Roy. Roy’s service is excellent! What impressed me most is the efficiency. I talked to him on Friday and my place is on the market on Monday. About three weeks later I have an offer! On top of that I always had more than enough time to prepare for any showings and this is very important. Excellent job Roy! Before meeting Roy we were looking at purchasing a home for approx. two years I got the feeling from other realtors that they thought we were just wasting their time. Roy was very professional and helpfully in our transactions of purchasing our home. I have recommended him to others and will continue to do so. Without his help I don’t think that this purchase would have been possible. SOLD FOR 100% OF ASKING PRICE! We have used Roy Thomas for both of our home sales. Both homes were sold in less than average time and he brought multiple offers to the table in both cases. Our first home sold for 99% of the asking price and our second home sold for 100% of the asking price. We would highly recommend Roy Thomas for your real estate experience. SOLD IN 2 DAYS FOR 99.8% OF ASKING PRICE! We would like to take this opportunity to thank the Roy Thomas Real Estate Team – particularly Roy and Yvonne for their exceptional professionalism and customer service in addressing our real estate needs. Both Roy and Yvonne really went to bat for us in both locating a home when we moved to Halifax from out of town – and then selling the home when we departed Halifax. It is a credit to their skill and expertise that they were able to facilitate both the purchase and the sale of this home with us living in a different city – and Roy’s patience in dealing with our young children as they ram shackled his office was a sight to behold. Thanks again Roy and Yvonne for making a very stressful endeavour into a successful and satisfying experience. SOLD IN 7 DAYS FOR 97% OF ASKING PRICE! Roy Thomas and his team are the people you want to handle your real estate needs. In the past few years, we have relied on his expertise to guide us through upwards of ten property transactions. Roy’s track record with us has seven houses sold within 97% to 100% of the asking price. Very impressive! Houses we have purchased have been successful mainly due to Roy’s experience in handling multiple offer properties. Roy Thomas is a hard-working, aggressive negotiator who always works in the best interest of his clients. We highly recommend him as a realtor! SOLD IN 1 DAY FOR 97% OF ASKING PRICE! We are writing to extend our sincere thanks to you and your team in the sale of our house. We were anticipating a stressful experience as we had very little knowledge of what to expect when selling a home. Your knowledge, helpfulness and patience made the whole experience worry-free. We were pleasantly surprised with the speed with which our house was sold. We also appreciated the way you kept in close contact with us throughout the whole process. We certainly will not hesitate to recommend you and your team to any friends/family who are looking for the services of a professional, knowledgeable and personable real estate team. Again, our thanks for all your assistance and we really can’t say enough good things about the Roy Thomas Team! We have nothing but the highest praise for Roy and his team. We had a bit of an unusual situation but Roy took the time to explain all of our options. I can’t think of anything Roy could have done differently that would have made a difference to a job already being done well. We do know someone who may be interested in selling but probably not for another year or so and we will certainly give them Roy’s’ name. SOLD IN 4 DAYS FOR 98.2% OF ASKING PRICE! We would like to thank the Roy Thomas Team for selling our home so fast. 4 Days is phenomenal! I think you may have set a record for this area and got us more than we thought! We would also like to thank you for finding us a new house to suit our budget and in our target area so fast. The pressure of finding a place to move was kind of overwhelming having two small children but you did all the work for us and assured us we would find our home. We found it! With the excellent negotiating techniques we were even able to place a more favorable offer then a competing offer and get the house we wanted. I will never buy again without a team of people like this on my behalf. It was (and is) a great experience! Thank you very much! SOLD IN 24 DAYS FOR 99.41% OF ASKING PRICE! They say that buying and selling a house is a very stressful process. We found that the Roy Thomas Team took the stress out of the process and made it a productive and rewarding process. We sold our house for well over its market value based on the house and location as well as purchased a home in our desired location meeting all our criteria for less than its assessed value. This was achieved efficiently and unfolded with great precision. There is no question, that the team approach is added value within the process and has lead to our successful results. This was a team effort and without any of these played; the results would have been undoubtedly different and less rewarding. The end result was achieved through all its players and the results were well beyond our expectations. Thanks to all Roy Thomas Team member! It was enjoyable working with each one of you! SOLD FOR 97.8% OF ASKING PRICE! I found Roy Thomas and his team to be very professional and quick to respond to feedback on showings on any questions we had. Excellent Selling Experience! SOLD IN 6 DAYS FOR 100% OF ASKING PRICE! Our thanks go to the exceptional team at Roy Thomas Real Estate Team. We recently bought a new home and sold our old home through the Roy Thomas team. We benefited a great deal by using this remarkable team. A Team member was always quick to follow-up a question, no matter what time or day it was. In order to comply with the timelines for the house inspection and water test, agents re-scheduled their day(s) in order to accommodate our schedule to make sure everything went off without a hitch. Working with these professionals made the stress of buying a new home much easier to handle. Roy Thomas sold our home in 6 days at 100% of our asking price! Roy’s unique marketing process generated three competing offers. Constant communication kept us updated on feedback from the viewings and always made sure we knew where we stood in the selling process. We would highly recommend Roy’s team if you are buying and/or selling a property. SOLD FOR 95.5% OF ASKING PRICE! I have got to thank the whole Roy Thomas Team for the fantastic service they provide me throughout the sale of my mobile home, and the purchase of my house. It was reassuring to me that there was a whole crew of professionals working on my behalf. Roy gave great suggestions on how to make my older mobile appealing to a buyer. The MLS listing was great, and the communication between myself and the team was first class. When it came to finding a suitable home to buy, you truly listened to my needs & concerns and sought properties that were geared towards both my budget and family. Together we found the property that was just right for me. Thank you so much! WELL BEYOND THE EXTRA MILE! Our Agent was a pleasure to do business with. I was made to feel important, taken care of, and at ease with the purchase of my first home. My purchase could have been especially stressful due to the fact that my boyfriend, with whom I have purchase the home, was out of province for work. Our agent offered support and assistance that went well beyond the extra mile and is certainly an asset to your team; the knowledge and people skills were second to none! Roy provided us with professional service and we would recommend his services. This has been a good experience and if we sell in the future we will call Roy. Very professional team with determination to sell your property. OUR HOUSE SOLD FOR 98.7% OF ASKING PRICE! Thank you for your assistance in the sale of our property in Williamswood. Our home was listed on December 8, and we received an offer on January 24. Our house sold for 98.7% of asking price, which was due to your professional marketing strategy. In our opinion, Roy’s support and communication was second to none. His professionalism, attitude and guidance in the sale and purchase of our homes were beyond what we expected. We have and will continue to recommend Roy. Once again, Roy, thank you for going that extra mile. ON THE FIRST DAY WE HAD 2 OFFERS AND SOLD OUR HOME FOR 100.5% OF OUR ASKING PRICE! OUR HOUSE SOLD IN 20 DAYS! Roy was the utmost of a professional. Roy is a knowledgeable, professional and pleasurable agent to work with.” He sold our house in 20 days for 96.1% of asking price. WE SOLD OUR HOME IN 4 DAYS FOR 98.3% OF ASKING PRICE! My husband and I had the pleasure of dealing with Roy Thomas for the second time when we sold our home in just 4 days for 98.3% of asking price. Roy has a creative marketing approach along with a professional, knowledgeable and helpful team. I would not hesitate to recommend Roy and his selling team to anyone looking to buy a home or sell their current home. Roy was also very helpful and always there when needed on the purchase of our new home as well. He ensured all of our questions and concerns were answered in a timely manner. Roy’s knowledge and experience are sure to be a great asset to anyone looking for an agent. Once again, thank you Roy for everything. I used Roy Thomas many years ago to sell a property on Birch St. in Fairview. I was very pleased with him and his team. The property sold very fast, and for a fair price at that time. I would certainly consider using him again if I ever sell another property. Thank you for selling my home in only 21 days. You SOLD my house quickly and efficiently and even obtained a fast closing. I would recommend Roy to anyone who wants to sell. WE HAD 2 COMPETING OFFERS ON OUR PROPERTY! I listed with Roy and within 40 days had 2 competing offers at the same time. I was very impressed with the constant communication and activity reports I received from Roy. I would recommend Roy and his unique marketing methods to anyone who wants to sell. 5 OTHER AGENTS COULDN’T SELL MY HOME BUT ROY PRODUCED MULTIPLE OFFERS! Over the last several years I had my property listed with 5 different agents with no success. I listed with Roy and in 38 days I had 2 offers at the same time on my property and I sold it for 95.8% of asking price. I would recommend Roy to anyone who wants to sell their property. SOLD IN 6 DAYS FOR 96.5% OF ASKING PRICE! Roy listed my property on a Monday and 6 days later, on Saturday, I accepted an offer and sold my property for 96.5% of asking price. Thank you Roy for your help. SOLD IN 1/3 OF THE TIME WE EXPECTED! Thank you very much for help in selling our home. We were expecting to wait for up to 6 months to sell, yet you sold it in only 2 months. Thank you and we would recommend you to anyone who wants to sell their home. AFTER 97 DAYS WITH OUR FIRST AGENT AND NOT ONE OFFER–3 WEEKS AFTER WE LISTED WITH YOU WE SOLD FOR 97.7% OF OUR ASKING PRICE. This is to thank you for the excellent service in marketing and selling our home. In our first meeting, you presented us with current facts and figures on selling prices in our neighbourhood and even took the trouble to separate the different types and styles of townhouses, so that we saw the market price for our specific type of townhouse. You gave us a realistic basis on which to calculate our selling price, excellent, detailed advice on showing our home and help in determining the net proceeds of the sale. You did extra and innovative advertising and we knew that any interested buyers would be able to reach you without delay. After 97 days with our first agent, and not one offer – three weeks after listing with you, our house sold for 97.7% of our asking price. We were pleased that you always took the time to follow up showings with a phone call, and took the trouble to make sure that we were informed of viewers comments. I would highly recommend you to anyone selling or buying a home. Thanks again. SOLD IN 1 Day FOR 98% OF ASKING PRICE! Thank you for selling my home so fast. It hit the MLS system at 3pm and we had an accepted offer by 11pm for 98% of my asking price. Your team was very professional and well organized. The home staging that you did on my property was outstanding and presented my house so well that the first buyers who looked at it immediately wrote an offer. I have previously dealt with other agents in other real estate transactions but have never been so impressed. I would recommend that anyone who wants to sell their home fast and for top dollar should hire Roy as their agent. I also used your team to purchase a new home. I believe your system allowed me to buy quickly and for the best price. Thank you very much for your assistance in the recent sale of my property. Your internet website, unique marketing methods and mortgage financing connections produced an accepted offer for 95.5% of asking price in only 23 days. I would recommend your services to anyone who wants to buy or sell real estate. ROY SOLD 2 PROPERTIES FOR US! Thank you for listing, marketing and successfully selling two investment properties for me in the last year. Your aggressive marketing and persistence not only generated offers but successfully closed both properties. I would recommend Roy to anyone who wants to sell or buy real estate. EXCELLENT EFFORT AND POSITIVE GUIDANCE! I would like to take this opportunity to thank you once again for helping us find our new home. Your positive attitude was such a help in keeping us motivated especially during long hours of looking for the right home. The fact that you showed us homes not only from your company, but from every company available showed me and my family you were there to look after us. I spoke to other realtors as well as you and not one of them showed the true enthusiasm that you showed. I would highly recommend your Team to anyone looking to purchase a new home in the Halifax area. Again from Sue, Ryan, Brett and I thank you for doing such a great job. Keep up the good work and we look forward to working with you in the future. SOLD IN 12 DAYS FOR 100.1 % OF ASKING PRICE! We would like to thank Roy Thomas and his team for successfully selling our home in two weeks. After living in our home for 38 years the thought of selling was very stressful. After talking to Roy he assured us not to worry. Roy and his team kept in close contact with us concerning all aspects of selling our home. Thank you Roy! You are a pro in the Real Estate business and we would highly recommend you to anyone wishing to sell a home. Thanks again. We chose Roy Thomas to sell our house and buy a new house. We needed a home with fewer steps. The day after our call, he found our current home, which we have been in for almost a year. In addition to a large deck off the master bedroom and kitchen, a washroom is situated off the master bedroom. It is split-entry. There is a wood stove and Jacuzzi and bar, which we enjoy immensely. We have not seen a shed too often the size of ours. He eased the stress of the process, as he has been in the business for several years. He knows what to do when, he has great strategies, he is intelligent and professional, he has excellent contacts in the business, and he enjoys his job to the fullest: there is a sparkle in his eyes and a friendly smile, and he has a wonderful sense of humour. We have known Roy for around 40 years, and are very proud of his accomplishments! ROY MADE A DREAM BECOME REALITY! It was really tough to do a testimonial as words cannot express how we feel about your representing us in the purchase of our first home. The service was first class! Your knowledge of the area and prices were what we were looking for in an agent. If and when we decide to sell or purchase another home we will be calling The Roy Thomas Team. Thanks for all that you have done for us. My business transactions with Roy Thomas were quite positive. Roy provided frequent updates of advertising and information regarding the current real estate market for my location. His news bulletins kept me on top of what was happening. Roy was very organized and timely. He was professional and personal. SOLD FOR 100.4 % OF ASKING PRICE! We were quite pleased with the service Roy Thomas provided us over the period of time our home was for sale. Roy was very prompt with updating us on any new information regarding showings and market news in our area. He would spend valuable time discussing marketing strategies and always remained calm and professional. Since we had moved out of the province and left our home vacant we felt very much at ease when Roy was able to tend to matters we could not. Roy, we want to thank you again for your honesty and integrity. It is a major relief our home is now SOLD.